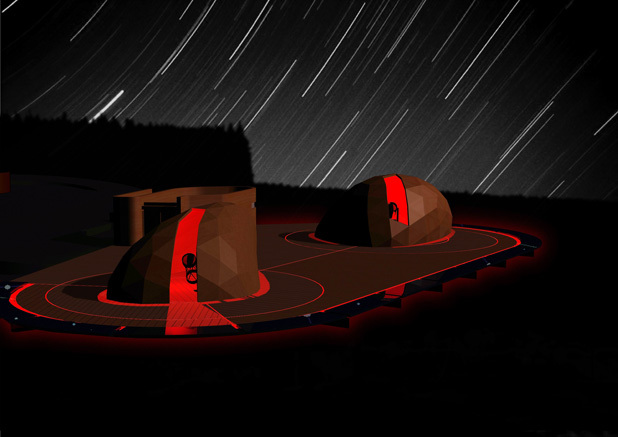 Our proposal titled “Starry Messenger” has been shortlisted in the RIBA organized international architectural competition for a energy-efficient and publicly accessible observatory in Kielder, Northumberland, UK. 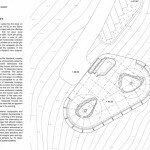 The design uses the material, topographic and visual qualities of the site to heighten its scenographic potentials. It speaks out this landscape’s artificiality by reverting to the strange and the unfamiliar. Galileo Galilei (1564-1642) called his first book on astronomy ‘Sidereus Nuncius’ (1610), or the ‘Starry Messenger’. He was fascinated with the offerings of his ‘perspective-glass’ so much so that he gave away telescopes to the worthy as gifts. 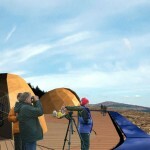 We regard Kielder Partnership’s initiative to provide an observatory to Kielder as a similar gift-giving act of publicity. 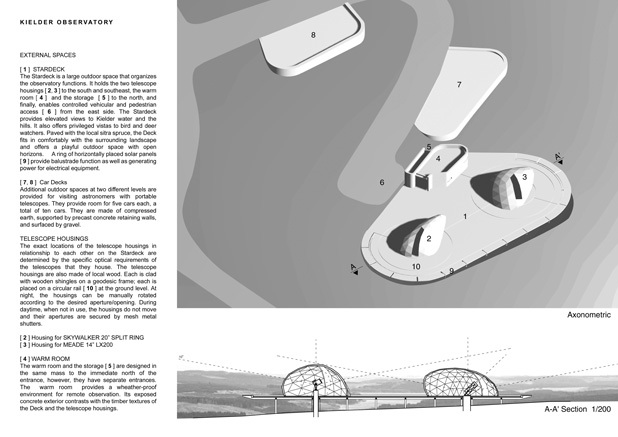 In this spirit, we call our project for Kielder’s new observatory ‘Starry Messenger’. 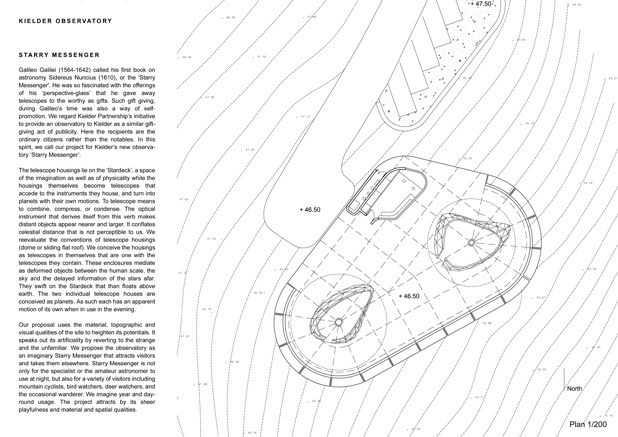 The telescope housings lie on the ‘Stardeck’, a space of the imagination as well as of physicality. The housings themselves become telescopes that accede to the instruments they house, and turn into planets with their own motions. The optical instrument that “telescopes” (to compress, condense) makes distant objects appear nearer and larger. It conflates celestial distance that is not perceptible to us. After reevaluating the conventions of telescope housings (dome or sliding flat roof), we arrived at a solution in which the housings act as telescopes in themselves by becoming one with the telescopes they contain. These enclosures mediate as deformed objects between the human scale, the sky and the delayed information of the stars afar. They swift on the Stardeck that then floats above the Earth. 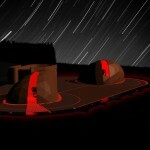 In the evening, the two individual telescope houses turn into planets with apparent orbits of their own. The dislocated apparatus of seeing, used to watch distant stars and planets, becomes a planet itself: an object that asks to be seen; the heavenly sky becomes its backdrop. 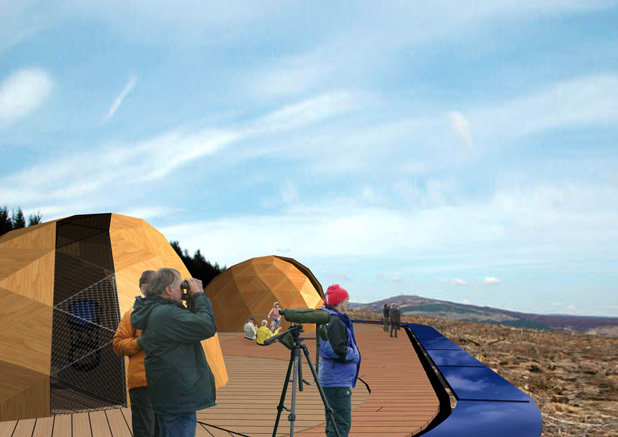 We propose the observatory as an imaginary Starry Messenger that attracts visitors and takes them elsewhere. Starry Messenger is not only for the specialist or the amateur astronomer to use at night, but also for a variety of visitors including mountain cyclists, bird watchers, deer watchers, and the occasional wanderer. We imagine year and day-round usage. 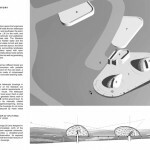 The project attracts visitors by its sheer playfulness and its material and spatial qualities.